Banshee TV show on Cinemax. Pictured: Antony Starr. Credit: Gregory Shummon/Cinemax. What are you going to do, now? The Banshee TV series finale, “Requiem,” airs tonight, on Cinemax. Showrunner Jonathan Tropper, who created the show with David Schickler, talks about why they made the decision to end the show after four seasons, leaving Banshee effectively cancelled by its creative team. 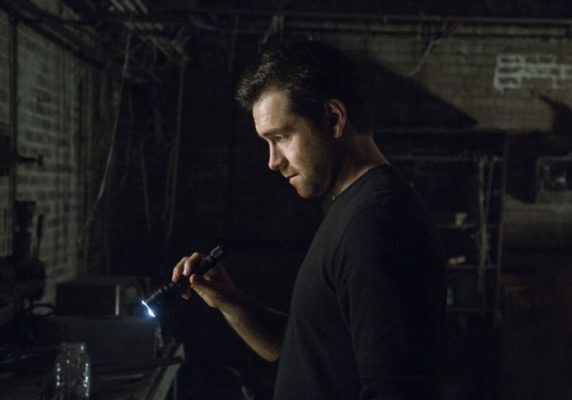 Banshee stars Antony Starr as Lucas Hood, who is back in town after a couple of years, where there is a serial killer on the prowl. The Banshee TV show cast also includes Ivana Miličević, Ulrich Thomsen, Frankie Faison, Hoon Lee, Matt Servitto, Ryann Shane, Lili Simmons, Tom Pelphrey, Eliza Dushku, Casey LaBow, Chris Coy, and Ana Ayora. Banshee TV show on Cinemax. Pictured: Tom Pelphrey, Matt Servitto. Credit: Gregory Shummon/Cinemax. What made four seasons the right end point for this show, and what made eight episodes the right number for this season? Is that just what you needed to tell this particular story? TROPPER: The fourth season being the last season was a combination of factors. I was always upset when shows I loved stuck around too long and starting generating extra plot. Once we ended Season 3 and Lucas Hood was basically no longer the sheriff, the premise of the show was about a fake sheriff, so going on for many more seasons, it would have been ridiculous for him to become the sheriff again. The town itself might have had plenty of stories to tell, but it felt like the story of Lucas Hood was coming to an end. All the pitches we came up with, for how to extend that, felt like, “Well, maybe that’s cool, but that’s a different show.” The move to Lucas’ post-sheriff life was the beginning of the end. It was the beginning of the conclusion, and trying to have a conclusion for two seasons, it felt like we would lose some of the immediacy of the storytelling. And ending with eight episodes was really a financial decision. We have a finite amount of money. To have done ten episodes at that budget, we would not have been able to deliver the action we wanted to deliver, and we wouldn’t have been able to deliver the depth of episodes that we’re accustomed to doing. So, we decided to do eight episodes and make them really rich. Banshee TV show on Cinemax. Pictured: Eliza Dushku. Credit: Gregory Shummon/Cinemax. Looking back on the run of the series and everything you were able to accomplish with it, what are you most proud of? TROPPER: I’m just proud that we got a show on the air when there was no precedent for this kind of show. We pitched a show that didn’t resemble any other show, and then we executed the show in a way that it didn’t resemble any other show. On paper, this show sounded pretty insane. We somehow convinced the guys at Cinemax to let us do it, and they let us do it without really messing with it. We had a show that, in a million years, couldn’t show up on a broadcast network, and hadn’t even shown up on any of the premium networks. In the four years since, you do see a lot of other shows like that starting to happen, but I really do think that we put the kind of show on the air, with the cinematic storytelling and action that we were doing, and the kind of heightened pulp, that really carved its own niche and hadn’t been on the air before. I’m really proud of that. I don’t think I could have even done the show that I’m doing now for Cinemax, if Banshee hadn’t come first. Banshee TV show on Cinemax. Pictured: Ivana MIlicevic. Credit: Gregory Shummon/Cinemax. Here is the Cinemax description of the Banshee TV series finale, “Requiem.” Watch a preview, below. Resolved to leave Banshee, Lucas learns that the murder case he thought was finally closed may in fact be opening again. After a tense faceoff with Calvin and the Brotherhood, Proctor looks to finalize his deal with the Colombians. Carrie takes aim at one final act of vengeance. Brock demands allegiance from Bunker (Tom Pelphrey) as Banshee braces for an uncertain future. What do you think? Are you a fan of the Banshee TV show? Is it ending at the right time, or do you wish Banshee had been renewed for a fifth season? How do you want the Banshee TV series finale to end? Banshee is one of the two most under-rated shows in the history of television (The Americans FINALLY got some long overdue recognition AFTER it ended.) The writing, directing, acting and fight choreography was breathtaking and adult, and the characters were multi-layered and alive. The conflicts were almost Biblical in their implications, and it was a thrill ride beginning to end. Thank you for 4 seasons of brilliant television. This is one of the best shows I’ve ever watched. This couldn’t possibly be the end of the series!!!! Please give us one more season!! !